The rocket landed in the village of Mishmeret about 25 kilometers (about 15 miles) north of Tel Aviv, making this the farthest a rocket has been fired into Israel since the 2014 war fought between Israel and Hamas. 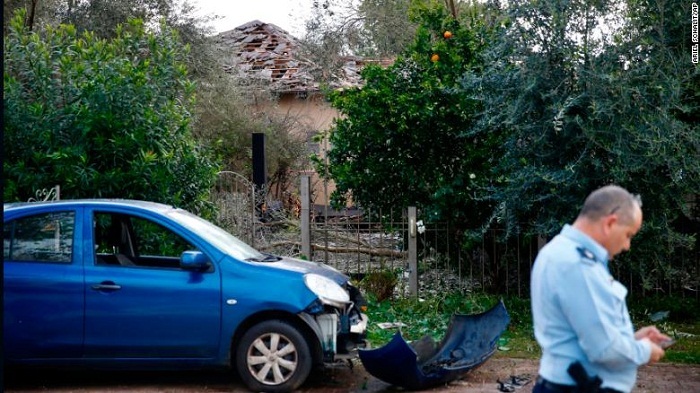 Six people inside the home were injured when the rocket landed, including a woman in her 50s who suffered light to moderate injuries, said Magen David Adom, Israel's emergency response team, in a statement. No one has yet claimed responsibility for this rocket. The Monday incident comes less than two weeks after two rockets were fired at Tel Aviv, the first time rockets had been fired at central Israel in almost five years. The Israel Defense Forces (IDF) assessment was that the rockets -- which caused no damage -- were accidentally launched by low-level Hamas operatives, local media reported. Israel responded to that attack with air strikes on about one hundred militant targets in Gaza, including an underground rocket factory, a training facility and a logistics headquarters. The firing of this latest rocket coincides with Israeli Prime Minister Benjamin Netanyahu's visit to the United States, during which he will meet President Donald Trump. Netanyahu announced that he would cut his trip short due to the incident. "In a few hours, I will meet with President Trump, and immediately after that, I will return home to manage our actions closely," Netanyahu said Monday.